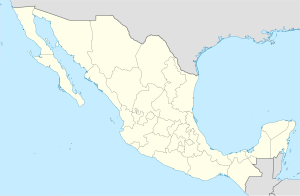 Ciudad López Mateos is a city in State of Mexico, Mexico, and the municipal seat of the municipality called Atizapán de Zaragoza. The city was previously named San Francisco Atizapán, but the official name was changed after president Adolfo López Mateos, who was born in that town. However, the city is still commonly known as Atizapán. There were 489,160 inhabitants according to the 2010 census. It is the seventh-largest city in the state. This was the hometown of Mexican president Adolfo López Mateos, and a mausoleum was built for his remains in downtown Atizapán de Zaragoza. Also, various streams have their waterway across Atizapán such as "La Bolsa", La Herradura, "El Tecojote" and "El Xhinte". In the beginning of the 20th century, a train line called "Montealto" had its end in Atizapán. Recently, the "Viaducto Bicentenario" has connected a second-floor highway to the inner Mexico City. The project was built to commemorate the bicentennial of Mexico's independence. The Escuela Sierra Nevada Esmeralda campus, serving preschool and elementary school, is in Atizapán. Green Hills School South Campus is in Atizapán. ^ "Enciclopedia de los Municipios y Delegaciones de México". Instituto Nacional para el Federalismo y el Desarrollo Municipal. Retrieved August 27, 2015. ^ "Catálogo Localidades". Microrregiones.gob.mx. Retrieved 2018-04-21. ^ "Contact." Escuela Sierra Nevada. Retrieved on April 5, 2016. "Esmeralda Camino Chiluca Espíritu Santo, Lote 59, Rancho Blanco, Atizapán Estado de México CP 54570 "
^ "Planteles." Green Hills School. Retrieved on April 18, 2016. "Plantel Sur - San Jerónimo Dirección: Av. San Bernabé No. 960 Col. San Jerónimo Lídice México D.F. C.P. 10200 " and "Dirección: Rancho San Juan Zona Esmeralda Atizapán, Edo. de México "